You’re in the market for two things: a car, and the financing to buy it with. No problem. We can match you with a Barrie dealership that offers both — even if you have bad credit or no credit at all. Just complete our car loan application, get approved in 48 hours or less, and pick your new set of wheels. Complete your car loan application in just minutes. You can qualify for a loan even with bad credit or no credit. Only the dealer sees your info. Our loans range from $5,000 to $40,000. Access to Barrie’s best auto loan rates. There’s no charge to apply or get matched with a dealer. How do I qualify for an auto loan in Barrie? You have to be a Canadian resident earning at least $1,500 a month. You also have to be 18 or older and fully licensed. Will I still be eligible for a car loan if my last vehicle was repossessed due to missed payments? That’s the plan. A financial setback isn’t the end of the world. We accept all car loan applicants and regularly help drivers with impaired credit. The dealers we work with in Barrie specialize in bad credit car loans and they’ll most likely be able to accommodate you, even if you recently experienced a repo. What are mandatory vehicle disclosures and which ones apply to vehicle sales in Barrie? Mandatory vehicle disclosures are the details about a car’s history or condition that all registered dealerships in Ontario have to share with potential buyers. Visit the Ontario Motor Vehicle Industry Council (OMVIC) for a full list of mandatory disclosures. Which Barrie dealerships will accept my car loan? Only the dealership offering you the financing. Our car loan service matches you with one dealer from our network, that dealer then provides financing for a vehicle from their lot. What’s the interest rate on your car loans? It varies. We know that answer is not particularly helpful, but it’s accurate. We can’t say for certain what your rate will be because that’s up to the dealer offering you the loan. We can tell you that the rate typically ranges between 4.99% and 29.99%, depending on your credit and the type of car you want to buy. How does the car loan term affect my monthly payments? The longer the term, the more time you have to pay back your loan. Longer loans mean smaller monthly payments but more money out of your pocket on interest. It’s a trade-off. 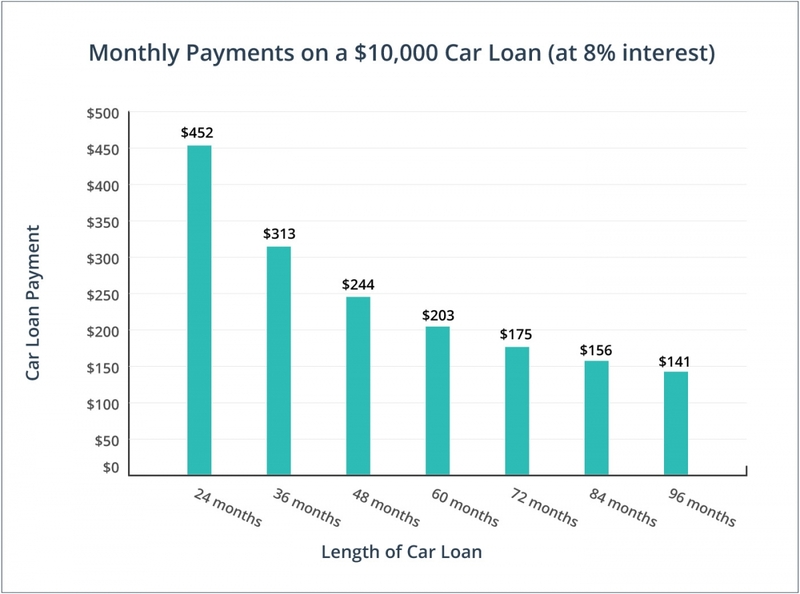 Check out our graph below to see how the length of your loan affects your monthly payments. Make sure you and the dealer settle on the auto loan terms (loan amount, length, interest rate, etc.) that you’re comfortable with before you start shopping for a car. ...about your potential car and about your potential loan. Do some preliminary research, make a list of questions, and bring a shrewd friend who can help you talk to the dealer. Try to choose a car loan term that doesn’t outlast the lifespan of the car you’re buying. For example, if you think you’ll need to upgrade your ride after 4 years, opt for a loan term of 4 years (48 months) or less. It’s not just about the price tag on the car. It’s also about the car insurance, maintenance, repairs, and gas — costs that your auto loan won’t cover. Factor these bills into your budget before you buy. It’s risky to get a car loan anywhere else but at a bank. False. A car loan is much the same regardless of which bank or dealer gives you the loan — Canadians are just more familiar with banks. But our car loan service is actually similar to a bank’s, and it's equally secure: we ask for your info, assess your financial profile, and then a dealer offers you a car loan at a fair interest rate. After a repossession, I have to wait at least 12 months before applying for a new auto loan. False. Waiting is a recommendation, not a rule. Some banks or lenders advise you not to apply for a new auto loan until your credit score improves — that way you can (hopefully) avoid high interest rates. But not everyone can afford to wait. We’ll work with you right away and help you secure a loan with a reasonable interest rate from one of our dealers — repo or no repo. I can use my auto loan to buy a car from a private seller. False. The auto loans you get through our service are for use at registered dealerships only, not for private vehicle sales. If I have bad credit, I shouldn’t apply for a car loan. False. We understand the hesitation: your credit’s already damaged, and you don’t want to add on yet another debt. But you need a car. And, actually, getting a car loan and making your payments on time can help you repair your credit. Banks aren’t the only ones that offer large auto loans. Through our car loan service, you may actually be eligible for a loan of up to $40,000. If you buy a used vehicle and the manufacturer’s warranty is still in effect, that warranty transfers to you, the new (and rightful) owner. Getting charged up is becoming easier in Barrie. An electric vehicle charging station is set for installation at the McDonald’s on 446 Bayfield Street. The stats say it all: about 82% of Barrie workers drive to their jobs, while only 4.6% commute via public transit. That’s a lot of drivers and a lot of cars.